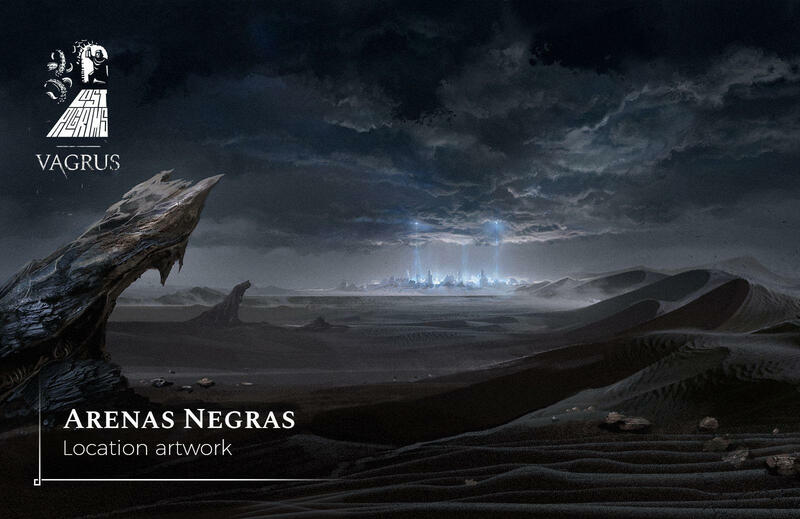 Called the Desert of Black Sands, or the Black Desert (Arenas Negrasin the Imperial language), this vast, empty desert that has fine, black sand instead of any other color is probably one of the most ill-reputed places of the post-Calamity era. Nothing lives here, not even insects. The silence is deafening. People who enter the desert and stay for a while usually inexplicably disappear. In the center of the area is a terrible place, supposedly the source of all evil in the region: The City of the Dead, Arx Mortis. Formerly the capital of the Sanvorati province and previously known as the Shining City, Calderum was made into its own horrible caricature by the Calamity. These days, Arx Mortis is a dead place filled with eerie moaning and groans, cast in perpetual twilight, beset by bone-chilling cold and a pale, frigid light emanating from the faded rocks that are almost all that remain from the once beautiful buildings and walls. Now these stand vacant and hollow, often reminding visitors of broken teeth peeking out of black gums. Whoever gets too close to the forsaken city is drawn to it, feeling an unnatural urge to enter it and lament its fall. The dark crevices in the ruins are home to undead beings, however, both of the walking and the ethereal kinds. Few who enter leave with their lives or their sanity intact, so most folks avoid the place and the desert altogether, even though it is known that the treasures and wonders of Calderum were never recovered.